The Academy of Buddhist Studies at Dongguk University in Seoul and Duke University are jointly hosting a one-day, international conference that seeks to place colonial Korean Buddhism (1910-1945) in a transnational and global context. Eight scholars of Korean Buddhism will present papers on the individuals and organizations who traversed national and cultural boundaries during this period (see below). Professor Richard Jaffe will give the keynote lecture on Japanese corporate pilgrimages to India in the mid-1920s to foreground how the resulting global networks were essential to the formation of modern Japanese Buddhist identity. Although it is still summer vacation for many, please know that if you happen to be in the Triangle area you are more than welcome to come and join us. 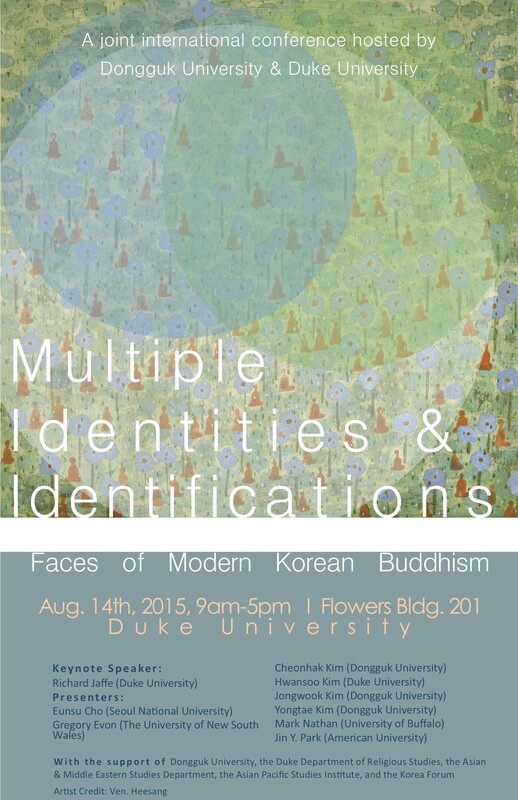 For further information, please contact me at hwansoo.kim at duke.edu. Richard Jaffe (Duke University), "Following the Cotton Road: Japanese Corporate Pilgrimage to India, 1926-1927"
Yongtae Kim (Dongguk University), "The Political Secularization of Modern Korean Buddhism and the Change of the Social Images of Buddhist Clerics"
Mark A. Nathan (University of Buffalo), "Reconfiguring the Boundaries of Modern Korean Buddhism: Paek Yongsong (1864-1940) and Complex Adaptive Systems"
Eunsu Cho (Seoul National University), "A Buddhist Nun's Perspectives on Modern Korean Buddhism Through Her Travelogue to Japan in 1937-1939"
Jongwook Kim (Dongguk University), "Manhae's (1879-1944) Buddhist Thought and the Sustainable Nationalism"
Gregory Evon (The University of New South Wales), "Propagating Buddhism through Fiction in Colonial Korea"
Cheonhak Kim (Dongguk University), "Kim Gu-gyeong's (1899-?) Liminal Life: Between Nationalism and Scholarship." Jin Y. Park (American University), "Kyongho Songu (1846-1912) and Existential Dimensions of Modern Korean Buddhism"
Hwansoo Kim (Duke University), "Politics of Representation: A Third Buddhist Community in Colonial Korea, 1920s-1930s"